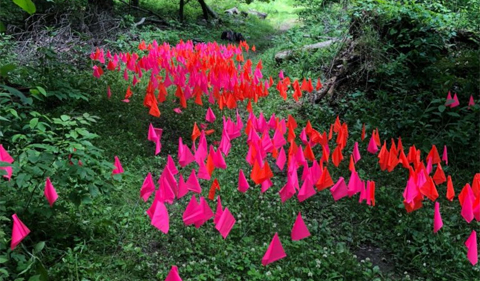 Flags for the rooted crowns of Running Buffalo Clover in a section of nature trail at Boch-Hollow Nature Preserve. The Ohio University plant biology and wildlife biology interns tagged along to help monitor the status of running buffalo clover, Trifolium stoloniferum, which is listed as an endangered species in Ohio. We traveled to two sites that day. The first to a site of Wayne National Forest in Creola, Ohio, to monitor a smaller population, then to Boch-Hollow to monitor the largest running buffalo clover population in the state. To monitor the population, we sectioned off areas and stuck flags in the rooted crowns (where the stolons run back to) and counted. Then, we pulled those flags and stuck flags to count the number of flowers in the area. Running Buffalo Clover is well on its way off the endangered list, since the populations are rising in all listed sites. The species of clover thrive on disturbance, so, it’s doing extremely well in the Boch-Hollow site because it’s along a nature trail that’s frequently walked on. At the Creola site, the population is found on a river bed, and it started to thrive after the river rose and fell again, clearing the way.